Full skirts demand full slips - and if you're into vintage clothing, you know we mean *full* slips. Whether they're called petticoats, crinolines or can-cans, these puffy flared under-layers were at the height of popularity in the mid-late 1950s. Popular again due to nostalgic fashions on TV shows such as Mad Men, the vintage aficionado who dresses the part needs not only the right frock, but the right undergarments. For those who lived through the look, I've been told that petticoats were often worn in quantities under one dress. And sometimes starched! One friend (who was a teenager in the 1950s) used to dip her crinolines in starch & water, and dry them in the arid climate of her attic. There she had room to stand them out as full as possible. Skirts this full had not been seen since the Victorian era, when ladies crowded rooms with their hemline circumferences. It's not a coincidence, either. Many 1950s designs borrowed from Victorian fashion, seen not only in full skirts but also in corset-like bodices and antique-inspired trims such as ruching and soutache. '50s petticoats likewise gave a nod to the Victorian with accents of satin ribbon woven through eyelet, fanciful scalloped hems and nosegays of faux flowers. When you purchase a petticoat, be sure to consider what you'll wear with it. 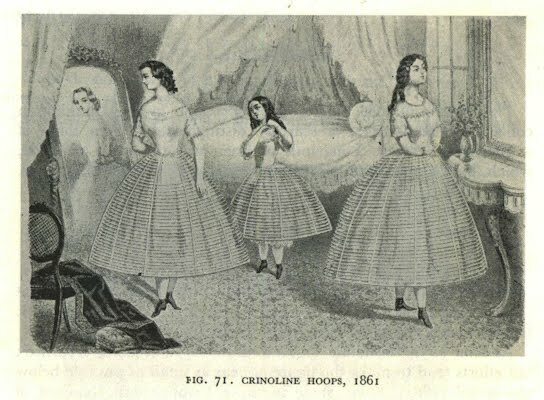 The length of the crinoline must be the same as the skirt length, or just a hint shorter. Too long, and it'll peek out so much you'll (literally) feel your slip is showing. Too short, and the skirt's line will break before the hem, always a sad sight to the vintage fashionista. Also remember these slips are meant for the fullest of skirts, either circle skirts or a design deeply pleated or gathered to the waist. One last tip - Some petticoats are so well-finished and opaque, they are easily worn as skirts themselves today. These have a fitted waistband (as opposed to exposed elastic) and dress fabrics like cotton chintz or sateen. Fabulous for ladylike street wear! Check out our current selection of petticoats & crinolines and enjoy the "ooh-la-la" of a vintage crinoline!